From the very beginning, the radio set was intended to complement the furniture found in the typical household. 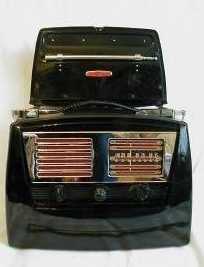 This was reflected by the use of 'traditional' styling cues such as fine wood veneer inlays and heavy construction that indicated high quality. The radio set was a focal point in the pre-television era and this is shown by the large floor-standing console type set as well as the tabletop models then available. 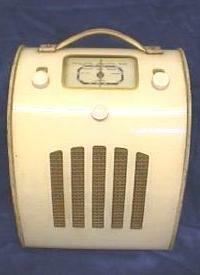 Radios were often expensive and intended to last for many years. In the 1930's, there emerged several new schools of design - most notably 'Moderne' (with its streamlined forms suggesting flight and speed) as well the style we now know as 'Art Deco'. Although wood could be moulded into shapes that incorporated these new forms, newer materials were developed to better enable these new designs. Chief amongst these was the invention of Dr Leo Baekland, who developed an easily and cheaply moulded new plastic he called 'Bakelite'. For some time throughout this period, this new material was fashionable and used in various new electrical appliances, as well as giving rise to imitations and improvements. In England, the radio manufacturer E.K. Cole had already produced groundbreaking radios in circular cases during the mid 1930's - the AD65, the AD36 and the AD76 - and these set new standards in the use of the new design concepts. Indeed, EK Cole were probably the first to mass-produce sets in Bakelite and explore the possibilities of this new material and imported technology. Undoubtedly, there are issues involved by being the innovator in any field, but Ekco appeared to go from strength to strength, despite never quite reaching the pinnacle they reached with these early sets. However, it would appear that there was market resistance, initially, to the new bakelite cased radios - despite their lower cost. 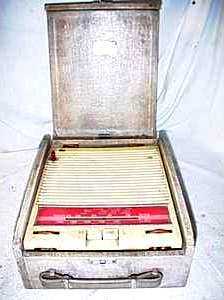 Allegedly, marketing departments from EK Cole's rivals put about the story that the sound from a bakelite set was inferior to that of a wooden set. 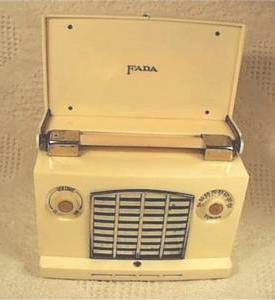 The predominant aesthetic of British portable radio design seemed to favour the wooden box covered in various coloured cloths such as 'Rexine' (a kind of 'artificial leather' that seems to be made of doped paper and cotton fibre with a printed design) or a similar material. Although the skills required for the construction of such designs were transferable where a manufacturer was also producing wooden cased table sets, it seems that there was little desire to experiment with new materials, shapes, colours or other design concepts. Taking these factors into consideration then it is hardly surprising that the square wooden box covered in cloth was considered to be the acme of taste and refinement for so long - in fact, right up to the death of the battery tube portable and just into the transistor era. Yet despite this, some manufacturers in the UK did become a little more daring. Most notably, the Pye P55MBQ demonstrated a good use of black plastic and chrome in a very pseudo-American look. Additionally, an 'honourable-mention' should go to other Pye suitcase models that, at least, used bright colours and polished chrome. Another British set that demonstrates admirable aesthetics is the Ever Ready Model C - this is a strange situation given the mediocrity of later Ever Ready designs but, again, could well have been a poorly marketed design for their target market. Of course, one could write reams about the British social condition of cheerful pessimism, the sluggish post-World War Two economies of Europe, the general backwardness of all aspects of mass-technology, good design, management and business theory etc. I believe that all these points contribute in a general way to the slow speed of change in aesthetics and design and that this, perhaps mirrored the decline of Britain as a world power and the gradual loss of its industrial dominance as export markets shrank to nothingness. However, there are various social factors to be considered in light of the wartime experience and the psychological mark it probably made on a great many people. In particular, and this is mirrored by the experience of the mass car industry which dealt with similar issues, the attitude of being 'spivvy' by demonstrating any tendency towards ostentation or gaudiness - both of which are simple external indicators of self-confidence. By way of contrast, in the United States, the prevailing 'mood' of the culture was (and is) one of great optimism and confidence. The USA was (and is) the world's most powerful economy and 'Yankee ingenuity' was overcoming all manner of problems to improve the health, wealth and happiness of all. This great outpouring of productivity and wealth was, arguably, self-perpetuating and this is reflected in the boldness of design in domestic machines as well as architecture, as it had been for many years. Consider the Empire State and Chrysler Buildings of the 1930's. Consider the 1958 Cadillac De Ville - with fins almost 4 feet tall. Consider the rapid spread of visible wealth as demonstrated in the market penetration of telephones, colour television, refrigerators, microwave ovens and the rest. It becomes apparent, then, that good design is as much to do with prevailing corporate philosophy as market conditions. Where the market is depressed, gloomy, grave, then light and airy designs may be ill-suited to a sombre mood. Where the market is fast-moving, competitive, wealthy, then ever increasing levels of design and aesthetic ingenuity must be called for to maintain sales. Is there a rational explanation for the plainness of British portable radio design? Perhaps the social mores simply dictated 'plain'. The fact remains, the decline British radio industry was hastened by: an apparent inability to fully embrace the new transistor technology (understandable, considering the investment in valves): higher labour costs compared to the far-east; an unwillingness to change and develop customers tastes in design by the use of new materials, colours and styles. By way of a practical illustration, the better to understand the point of this essay, we can look closely at two particular models of British portable radio and what they tell us about the design aesthetic of the time. Here we have two very good examples of the kind of product that charted the decline of the British radio industry. They are both from 1958 and were designed and built by British companies that were well respected. Both sets use germanium transistors - finally made reliable ten years after development. Left - 'BPT333'. A 6 transistor set from EK Cole, Southend. Right - 'Q4'. 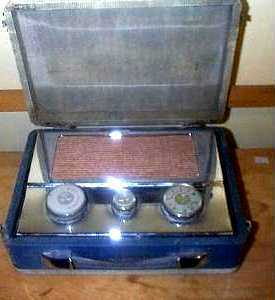 A 6 transistor set from Pye Radio, Cambridge. Let us consider these two sets for a moment. What is there about them? They both have un-exciting model names and conservative designs. Their colours are not particularly exciting (although the Pye cannot be descibed as 'drab') and they do not appear to shout-out a difference from their earlier valve-powered brethren still produced by some manufacturers. In spite of opportunities afforded by new materials and technologies, emerging female and teen markets, overall increase in disposable income and an increase in 'confidence' and social freedom, British radio manufacturers stayed in a cosy time warp of conservative, tried-and-trusted designs using a wooden box covered in 'leather' effect printed paper. Bear in mind that the England of 1958 was a relatively prosperous place. The economy was performing well and it was no longer necessary to concentrate exclusively on export markets - home demand could be satisfied. Why, then, were so many designers and manufacturers so cautious? However, as an upbeat aside, two manufacturers continued to prosper and build on their reputations. 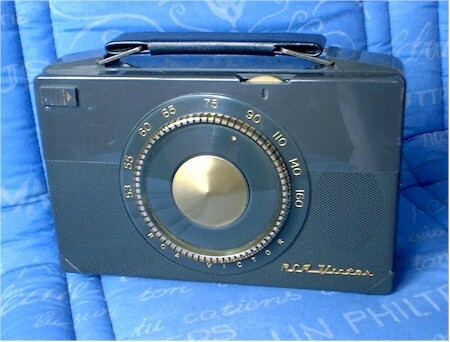 Roberts Radio are still going strong as a British company and Hacker Radio lasted for quite some time as a serious rival. As the 21st century progresses, Britain seems to have established several niches differentiated on quality and these appear to be thriving. However, given the British expertise in the production of luxury goods (think Rolls-Royce cars), it is strange that there was no British product at the higher end of portable radio to rival the likes of the Americans. Undoubtedly, the Zenith Trans-Oceanic series of portables, from 1948 onwards, served a niche market very well. These sets were certainly not cheap, but did have a carefully marketed cachet. Their rivals were such sets as the Hallicrafters Trans-World, the RCA Strat-o-World (and similar look-alikes by Motorola and Silvertone for the larger markets). Could such high-priced radios not have been supported in England in the same period? Zenith's star did eventually fall and the Trans-Oceanic became a transistorised shadow of its former self. As international travel became mass market, many products associated with it moved downmarket too.